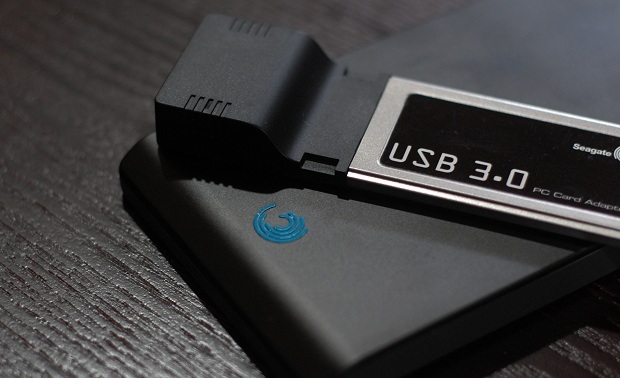 Most hardware manufacturers are finally rolling out USB 3.0 devices. We’ve seen motherboards, hubs, hard drives, and notebooks all rocking the new and improved USB standard. It’s clearly the future of USB with backwards compatibility, dramatically faster speeds and full-duplex data transfers. That’s great, but it’s still not faster than eSATA right now. Testing parameters: These numbers were gathered using HD Tune Pro 4.01. I also timed an 8.34 GB file transfer onto the drive for real world results. The two external drives were 7200 RPM models, while the internal was a 5400 RPM drive. I would have liked to show the Western Digital MyBook 3.0’s results as well, but the drive and HD Tune Pro didn’t get along. Check out the review for a comparison between the Seagate PS110 — it’s just slightly faster. Of course USB 3.0 brings a host of other improvements over the 2.0 spec and eSATA. It’s dramatically more power efficient, allowing more power-hungry bus-powered devices and better power management when devices are idle. USB 3.0 also can theoretically hit 600 MB/s. But right now it’s not the ultimate external data transfer protocol. That title belongs to eSATA. This will likely change over the next few years as computer hardware catches up to USB 3.0. The situation is nothing new. Most up and coming technology is limited by current hardware. USB 2.0 went through the same thing years ago. But if you’re looking for a reliable and fast external hard drive right now, forget USB 3.0 and instead look at eSATA drives.